If you are looking to remodel your kitchen or in the design phase with your home builder consider carefully the options for a walk-in pantry versus a pantry of cabinetry. A walk-in pantry can be as small as a 5ftx5ft (25sf.) space. Such a space can include a great deal of storage shelving too (60 linear feet). It would only be 12 linear feet of 2ft. deep cabinet to fit similar sq.ft. (24 sf.) in a cabinet pantry. Plus cabinetry will typically cost more compared to the modest finishes that can be hidden within a walk-in. However, space layout and your desired design style may warrant the tall cabinet look that is often sought after with the cabinet pantry. Talk closely with your designer on what work best for your cooking style and budget. This will help assure that you get the best pantry option that fits you. Let us know what you think is the best pantry option. Everyone manages their kitchen differently so share your style! 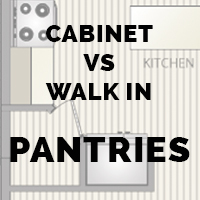 Visit us on facebook for Cabinet vs. Walk-in Pantries!